This is today’s topic that after the remarkable election, who the most powerful people are in the UK. It’s probably someone that you never heard the name. Or, you may know a few about of them. Theresa May, the current Prime Minister, are the most powerful people in the UK according to the Forbes. But, she is only one on the list and we have to know some more people to complete the list into 10. So, we’ll try to reveal the entire image of the 10 most influential people in the UK in this post. Before we proceed to know them, there is an overview of the UK’s most influential people below. According to the analysis, among the most powerful people in the UK, 97% are white. Out of the 1,049 most powerful figures in Britain only 36 people are from BAME (Black Asian or Minority Ethnic) background. However, almost 13% of the UK people are from a BAME background. It means that there would be around 136 people on the list if there were proportional representation in society. The report was published in the Guardian and was compiled by Operation Black Vote (OBV) for their Color of Power campaign. It’s said on the report that if you’re black or Asian, the pathways to power are almost non-existent. Moreover, not least because in most sectors there has been little or no progress at all, the lack of diversity at the top level is deeply troubling. This is because the white club virtually locks out black talent. 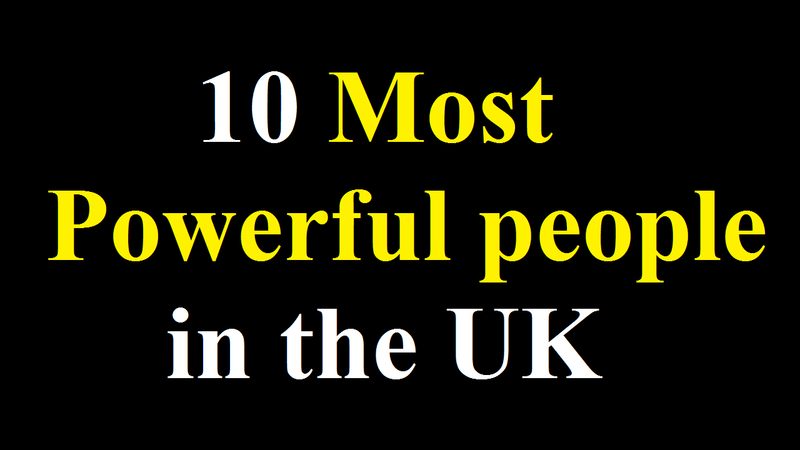 Who are the Most Powerful People in the UK? The Prime Minister is currently the most powerful people in the UK, but it’s not always the case. The recent by-election victories and massive leads in the polls suggest she’s going nowhere when a parliamentary majority of 16 is weak on paper. Her heels as Brexit negotiations commence will all eyes on her. As a Prime Minister, she takes the most important decisions. This is because she is at the top of this list. Since 1985 Sorrell has run WPP and initially it was a basket manufacturer. Here the term WPP stands for ‘Wire and Plastic Products’ and it’s a UK manufacturer of wire baskets, which became the ‘foundation’ company in which Sir Martin Sorrell invests following his search for a public entity. After that, he transforms it into an advertising giant employing 200,000 people across the UK. He took home over £70 million last year as one of the most respected voices in the business. Emma Walmsley is the daughter of Vice-Admiral Sir Robert Walmsley and Lady Christina Walmsley. She was born in Lancashire (now Cumbria) in June 1969. In the St Swithun’s School, she was boarded and then from Oxford University, she earns her master’s degree in Classics and Modern Languages. When she becomes CEO of GSK this month, she will be the most powerful woman on the FTSE 100. The mother of four keeps her private life to herself but expects to hear much more joining after 17 years at L’Oreal. Founder of the Virgin Group that controls more than 400 companies in the UK and worldwide. At the age of 16, his first business venture was called Student magazine. But, he set up a mail-order record business in 1970. Here, he is a staple of any business list for his archetypal entrepreneurship. He’s now worth over $5 billion as the founder of the Virgin group. Hates wearing a tie, and ardently supports a second EU referendum and he wants to fly to space, is pally with the Obamas. Known as Charlie Mayfield, Sir Andrew Charles Mayfield is a renowned businessman in the UK. Since 2007, he has been Chairman of John Lewis Partnership. Moreover, he previously serves in the British Army as an officer and also the Chairman of the UK Commission for Employment and Skills (CES). Sir Charlie Mayfield matters as Chairman of John Lewis, which is Britain’s best performing employee-owned company. Besides, he constantly defends the model of sharing profits with employees, which results in staff receiving a bonus of up to 20% of their salary as a former soldier. Chief executive officer of Unilever Paul Polman and she is speaking at the opening of Four Acres. It’s the company’s first global leadership development center in Singapore, outside the UK. Since 2009, Polman has run Unilever, which incorporates over 400 brands. Its CEO is determined to continue running the firm in a responsible and ethical way, whilst ensuring it grows despite recent difficulties, including a hostile takeover attempt. a British businesswoman, director-general of the Confederation of British Industry and former non-executive director of the Competition and Markets Authority, Lloyds Banking Group and the UK Statistics Authority are Carolyn Julie Fairbairn. She was born on December 13, 1960. Fairburn is one of the most influential people on the business scene; able to call any CEO she pleases as the head of the group that represents British business. Including stints at ITV and the BBC, she’s had a 30-year career. Lakshmi Mittal is still listed as one of the richest people in Britain with a fortune of $16.7 billion and his wealth has dipped from its 2009 high. He is the CEO of the world’s biggest Steel manufacturer may be struggling with Chinese competition. Above all, he’s got brains that bring the wealth. Every Briton can be proud of Apple’s English Chief Design Officer, but his resident in the United States. As being his ‘spiritual partner’, a role for which he receives over $130 million so far, Sir Jonathan has designed their best-loving products including the iPhone and iMac and Steve Jobs describes it. These are the most powerful people in the UK in short because there are a lot of people on the list. These include Mike Ashley, Mark Carney, Lord Sugar, Rupert Murdoch, Warren East, Martin Gilbert and many more. So, be with us for our next update about this topic!